The issue of appropriate dress has recently been a hot topic of debate in Malaysian Borneo. In 2015 the Muslim community was enraged by a group of Brit, Canadian, and Dutch tourists who stripped naked and posed atop sacred Mount Kinabalu. In June, 2018, two Chinese tourists dressed in skimpy shorts climbed up on the low wall that surrounds the mosque and performed a syncopated dance while a friend videoed them. Soon after the video was published, management closed the mosque to the public while they decided how to handle the situation. It reopened on August 1st with new rules in place. All visitors must register at the front gate, where their attire is inspected. Those who are not properly dressed are now required to rent appropriate clothing. My short sleeves meant I had to don a tudung (headscarf that covered all my hair) and juba (long robe that covered me from my neck to my ankles). With temperatures hovering around 97 degrees and extremely high humidity, I was exceedingly uncomfortable. I made a cursory circuit of the interior, which was uninspiring. Then, faint from the heat, I walked back to the entrance as quickly as the heat allowed and peeled off the rented garments. I ended my visit with one more view over the lagoon, drinking in the mosque’s magnificent blue dome and four delicate minarets. 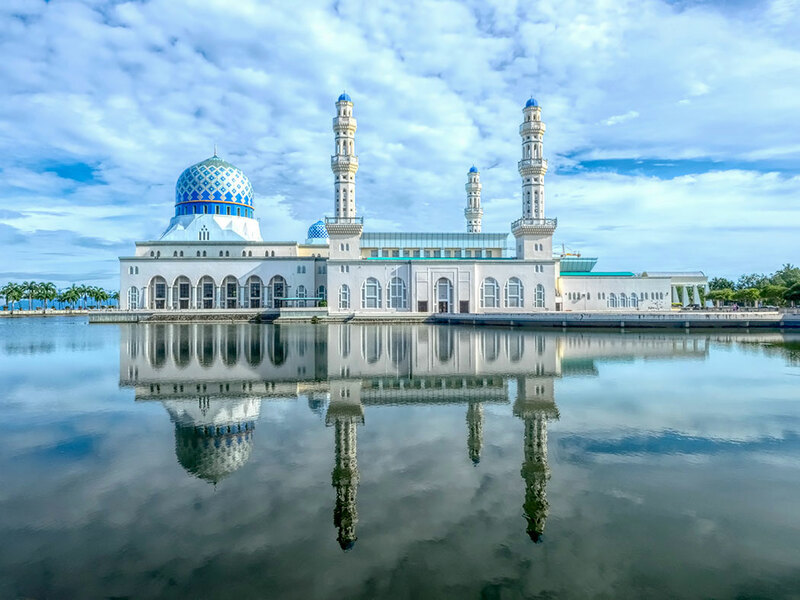 For me, the true beauty of Kota Kinabalu City Mosque was its stunning exterior. Beautiful Barbara. I got used to covering up tons in Oman; we lived in that conservative Nizwa neighborhood, so any time we left the house we covered up. Not too bad with 80s temps in Dec-Jan but during 120 summer temps, unbearable. I do get it though. I always share how we need respect local customs no matter what if we visit these spots. Absolutely Ryan. We are at all times guests in foreign countries and need to be respectful and conduct ourselves according to local customs. Lovely photo. My sister and brother in-law live in KK and they took us to see the Floating Mosque. We just walked around the outside and took photos of the interior through the many windows. Agree with you, very plain interior. Thanks Lynda. Having been there, you can really appreciate my photo!